We Guarantee Your Satisfaction. The best just got better! Though it's very rare but if for any reason you are not satisfied with your purchase we want to know about it. We stand behind our products 100%. We guarantee the quality on everything we sell. If you think something doesn't match up to our description of it, return the unused portion for a 100% refund or exchange, the original shipping & handling charges are non-refundable. The offer is void if product is more than 50% used. 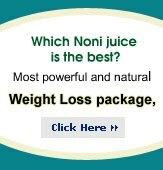 All returns must be authorized by NoniJuice.us in writing prior to returning the item(s) for a refund or exchange. Customer Service will make available to you a "Return Merchandize Authorization Number" or "RMA" number. This number is to be displayed on the outside shipping carton. Return the unused portion of your item(s) within 30-days from the date of purchase. Make sure you do not empty the bottle. We need you to return the unused product as it is. You are responsible to cover any shipping costs incurred to ship the item(s) back to our facility. We only ask that you include a short note telling us why you you weren't completely satisfied. It is mandatory to include the purchase order number as this is equivalent to your sales receipt. For orders outside of USA, we will provide you an address local to you country. Please be sure to include the purchase/invoice number. Packages that are returned without an RMA number will be refused upon returning to the warehouse(s). Refunds may be settled using the same payment method used to pay for the original purchase. All refunds and rebates are done on the 1st and the 15th of each month with no exceptions. In the event that a shipment does not arrive at the address specified for the order or your order is incomplete you must report to Customer Service that the product was not received. We ask that these reports are made within ten(10) business days from the purchase date.